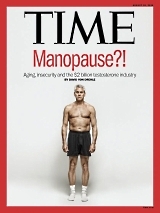 As adult men age, their testosterone levels plummet, dozens of studies have concluded. But according to researchers at the American Cooper Institute, the relationship between aging and testosterone is somewhat more complex. The Americans examined about three thousand healthy men aged 50-79 years, and found no association between age and testosterone. But they did discover that BMI and fitness do have a significant impact on the concentration of testosterone in the men's blood. The researchers measured the testosterone levels of their study participants in the morning. They classified a testosterone level of less than 250 nanograms per deciliter as a layer, a level of 250-399 nanograms per deciliter as normal-but-on-the-low side and a level of more than 400 nanograms per deciliter as normal. The researchers also removed one man from their sample because his testosterone level exceeded the 3000 nanograms per deciliter. Although the individual in question reported no medication usage, the researchers nevertheless decided not to believe him. The researchers had the men run on a treadmill so that they could measure their fitness. The determined their body weight as well. Then they looked if they found an association between the fitness levels of the men, their BMI, their age and their testosterone. Age didn't determine the men's testosterone levels. Whether the researchers looked at men aged 50-59, or men aged 60-69, or men aged 70-79, in all groups the percentage of men with low testosterone levels was somewhere between 10 and 11 percent. BMI and fitness did influence testosterone levels. The fitter the men were, and the lower their BMI, the higher was their testosterone level. "This cross-sectional study does not support the contention that testosterone decreases uniformly with aging in healthy middle-aged to elderly men", the researchers summarize. "Finding similar testosterone levels across decades of age suggests that lower testosterone is not an inevitable consequence of aging." "Testosterone levels were inversely associated with BMI and positively associated with fitness. This new finding of a strong association between objectively measured fitness and normal testosterone in the oldest age groups has intriguing implications." "Further research is needed to better understand the implications of our findings including understanding the expected testosterone levels in healthy aging, whether low testosterone levels will increase if fitness increases, and whether testosterone levels can be maintained despite excess weight and/or the presence of chronic disease in the setting of moderate to high fitness." Maturitas. 2018 Dec;118:1-6. doi: 10.1016/j.maturitas.2018.09.004. Epub 2018 Sep 29. Fat men are less masculine. The extra fat they carry feminises their hormone balance and reduces their testosterone levels.